NEW YORK, 2 November 2006 (BWNS) — In an ominous move, Iran’s Ministry of Interior has ordered officials throughout the country to step up the surveillance of Iranian Baha’is focusing in particular on their community activities. The Ministry has requested provincial officials to complete a detailed questionnaire about the circumstances and activities of local Baha’is, including their “financial status,” “social interactions,” and “association with foreign assemblies,” among other things. 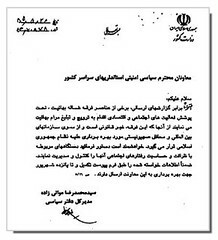 The Ministry’s order came in a letter dated 19 August 2006 and addressed to provincial deputies of the Department of Politics and Security in Offices of the Governors’ General throughout Iran. The 19 August letter, which was recently obtained by the Baha’i International Community, asks these deputies to order “relevant offices to cautiously and sensitively monitor and supervise” all Baha’i social activities. The letter is the latest in a series of threatening documents that outline a secret national effort to identify and monitor Baha’is in Iran. TORONTO, ON, 26 September 2006 (CBNS) — Lieutenant-General and Canadian Senator Roméo Dallaire said he is “alarmed” at the human rights violations being carried out by the Iranian government against Bahá’ís, in a statement released today and welcomed by Karen McKye, Secretary-General of the Bahá’í Community of Canada. The statement by Lieutenant-General Dallaire follows on the secret letter, recently made public by Amnesty International, from the Chairman of the Command Headquarters of the Armed Forces of Iran to other senior security forces calling for the monitoring of the members of the Bahá’í community of Iran, that country’s largest religious minority. The letter alarmed the United Nations Special Rapporteur on Freedom of Religion or Belief, Asma Jahangir, earlier this year. 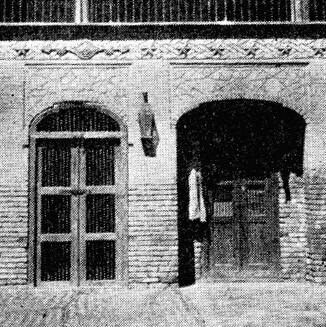 “Canadian Bahá’ís have been profoundly concerned about the ongoing persecution of Bahá’ís in Iran and the alarming upsurge in short-term arrests, a defamatory press campaign in government media, and other signs that the level of persecution is intensifying in that country,” says McKye. Ottawa, September 26, 2006 — Senator Roméo Dallaire said today he is alarmed by the picture emerging from Iran that reveals systematic religious persecution and human rights violations against the 350,000 followers of the Baha’i faith, Iran’s largest religious minority. While serving in the Canadian Forces, Dallaire commanded the failed 1994 UN mission in Rwanda where 800,000 men, women and children were murdered in 100 days during the worst genocide since the slaughter of Jews in World War II. Appalled at the world’s unwillingness to step in and stop the Rwandan genocide, Dallaire has since championed conflict resolution and international adherence to the rule of law. Now, Dallaire says the Iranian Baha’i community is under concerted attack by the state and state-supported organizations.